Here's my .02, if it's worth even that. I learned long ago, unfortunately the hard way, never to sub for a HO-wannabe-GC. There's one way those things go, and it's straight to hell in a hand cart. I'm guessing you have no contract, no permit, and no inspections. You were hired to remove the wall, and install the beam, (I guess ), then decided to let the HO do it hisself, because he didn't like your pricing? If you are a hack craigslist type contractor, carry one. This is how this $#!T goes. If, however, you are serious about this trade, you might want to think about moving on from this one, and do a better job with contracts, clients, and permits in the future. My guess is your client isn't going to reverse his rectal-cranial inversion anytime soon. Def not a hack I do have my builders license (if that means anything) take pride in ny work and do every job as if it's my house. I personally dislike hacks craigslist or not. I research everything even if I've done it a million times. He does have a permit. I was supposed to pull it but he ended up doing the whole process himself (getting ther engineer, materials, permit) so then it was just me installing per the plans(we see how that went). He's def HO-wannabe-GC ...and like you said... you learned your lesson...I just cant even imagine going through this again. If there is an approved set of plans, and he didn't install it according to the plans, it'll fail inspection. If he got a new engineer to sign off on that, then more than likely he'll have to re-submit to the city. At least, that's how it works here. If the HO is cutting you out of the work that you are contracted to do, you can sue him for breach of contract. If you have no contract, well, this might be a good time to pack you tools and move on. First off hello everybody! I'm in detroit michigan and was overseeing this load bearing wall removal. 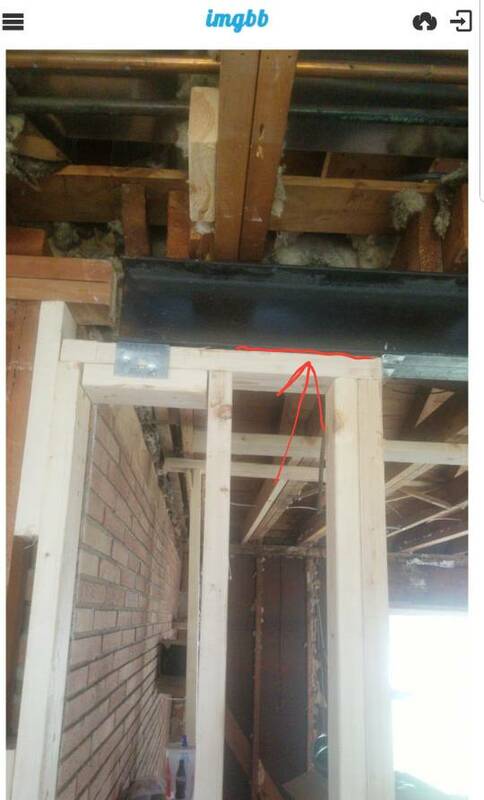 The company put the temporary walls up correctly...but according to the drawings, didn't install the beam correctly. I know there are different ways to do things but...although I dont think it's correct, I'm wondering your thoughts and opinions. How many Contractors does this HO have working on this job? Who is prime? The HO? Lol I was definitely thinking about calling for an inspection. I am preeeeety sure he didnt resubmit the plans cause he's super cheap. I love these kind of threads, ha. HO jerry rigging is great for laughs. Let us know how that inspection goes. Fill this gap with hot glue, G2G. Keep posting pictures. We like pictures. Ahhhh, that’ll all settle in. Lol it's been a while but I'll give you all a update later today. He has somebody else to do the drywall lol (thank you). But wants me to install the insulation and frame a wall out...that ge wants to help me with lol! Yeah, it's no good. Needs to be completely reset. Who knows if the load is properly transferred through the floor to footing/pad. This job is not going to end well. That little wall section wouldn't be acceptable if wasn't supporting anything. I don't know what that's supposed to show, thise are marketing pics.